Cleaning the oven is a whale of a chore, and it's something that's very easy to just put off endlessly. After all, grease that's hidden behind glass isn't as big of a priority as dust on the floor or stains on the kitchen counter. But every now and then, there comes a time when the oven just looks too horrifying to be left untouched. Harmful chemicals make for a tough time, though, where your lungs are in as much discomfort as the rest of your body from awkwardly leaning in and breathing in the product. For an easier, safer time, try baking soda. Martha Stewart swears by this method, which should be a testament to its usefulness: Create a thick paste using a ratio of 3:1 baking soda and water. The specific amounts will vary based on how big your oven is and how much grease you're trying to eliminate. Remove the oven racks and soak them in dishwashing liquid, then spread the paste on your oven's surfaces. If possible, use a paintbrush to even the paste out nicely. Then let sit for 24 hours. Once the baking soda has been given the amount of time it needs, wipe it off with paper towels or rags, wetting them as needed. If dried up baking soda remains caked to the surface, Newsner suggests spraying vinegar on it, then wiping again. 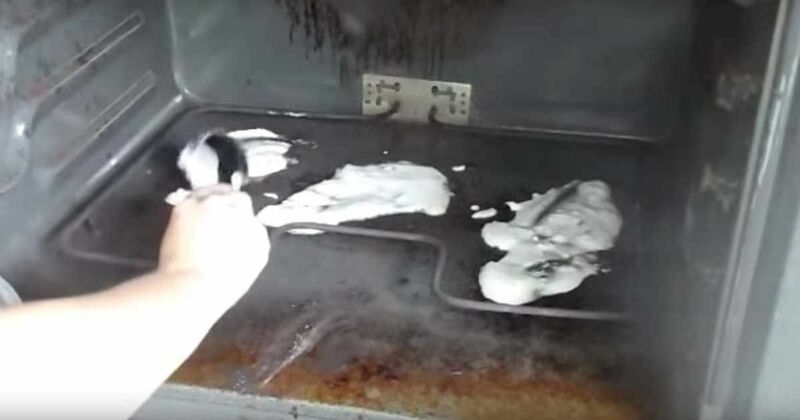 While the YouTuber in the video below, which shows the process in a little more detail, also applies baking soda to the oven door and window overnight, Martha Stewart suggests using simply white vinegar and water, while Newsner recommends the baking soda paste be left on for only 30 minutes. Feel free to experiment with the formula, and let us know what works best for you! Don't forget to share this tip with your friends and family. No one should have a messy oven! These tricks will make your small space seem so much bigger! Instead of spending all that money on cleaning supplies, make your own! If you look up, you might find your ceiling fan is covered with dust. Clean it up fast with these easy tips! In Ireland, the humble potato is treated with reverence. Far from being an afterthought on the side of the plate, the potato can be a thing of real beauty. This recipe calls for linguine, but you can also substitute in raw penne pasta.